Community-led and community-engaged design are increasingly part of the development and regeneration narrative, but what do these terms actually mean? Likewise what does this really mean in practice for those involved? We addressed these questions at Beyond Buzzwords: the language of collaborative design, the first of our WE design series of events, held in London at Living Space and delivered in partnership with The Open University’s Design Group. 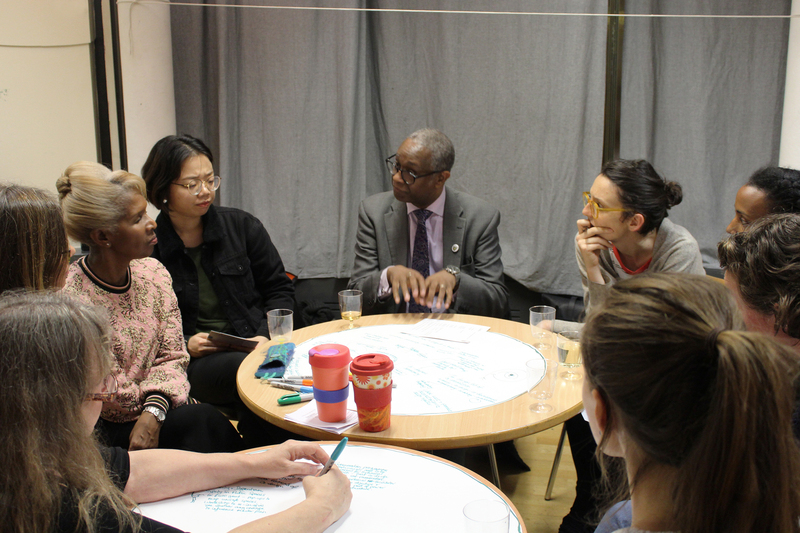 Community activists, students, and people from the fields of housing, design, community engagement and education, amongst others, gathered to examine the meanings of co-design, co-production, participatory design and community-led design. These terms are often used interchangeably but have distinctions. Can the distinctions between them allow greater specificity and transparency? And what can these distinctions reveal about what we aim for and what we achieve with these approaches? Attendees split into four groups, each group focused on one of the four terms, creating notes and diagrams of their conversations on paper circles which covered the venue’s round tables. Some circulated, before coming together for a conversation on the wider contexts of our terminology. The circles were placed on the wall in front of us providing a starting point for a visual wall, which grew with the conversation, charting key words and connections to map our explorations. Throughout the process participants were encouraged to share stories, projects they felt were excellent examples of community-led and / or community-engaged work. 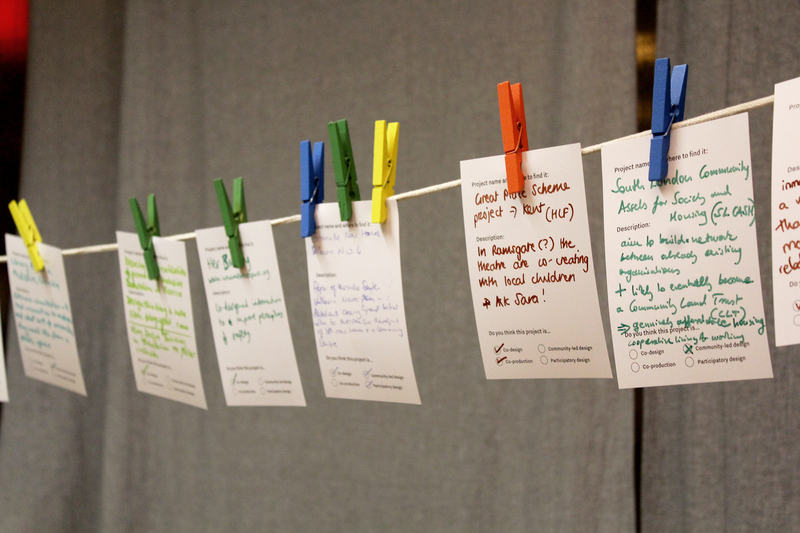 Coloured pegs were used to illustrate which of the four terms they felt applied to the project, with some attendees very clear on one example and others showing their projects contained all four processes. These activities led to a questioning of the terms of co-design, co-production, participatory design and community-led design. Participants explored where the power and agency lie in each and what kind of process each means. When are we talking about designing together and when are we actually developing a project brief with all stakeholders, which architects and designers can then work to? 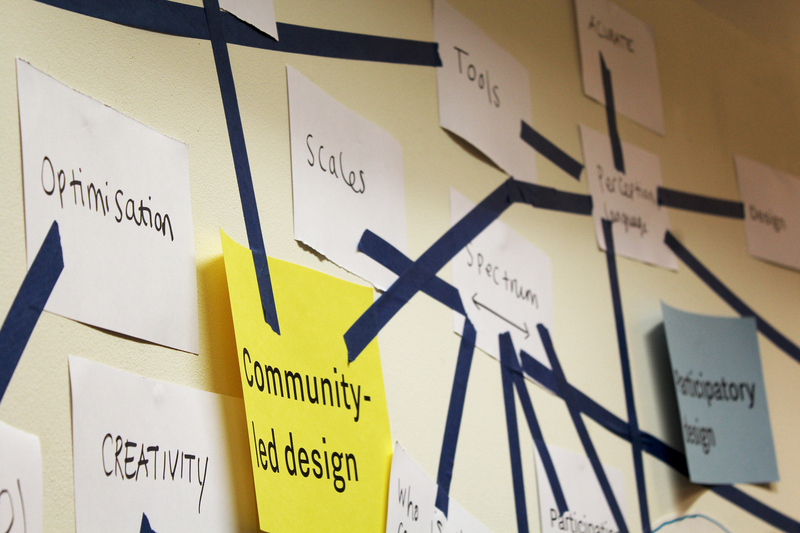 When is it essential for all stakeholders to be involved in all parts of the design process? Do all stakeholders on a project need design language they can utilise on a relatively even footing, in order to have equal agency within a process? Whilst the skill of designers and architects is an invaluable part of the process, participants also discussed the other side of capacity building, alongside empowering communities, building capacity among professionals to share power. This is something The Glass-House has found to be essential and championed over the years, learning from the communities we work with ourselves in doing so. Many questions were raised along the way, and different types of projects and limitations were explored. When participants were asked how many of them had had their understanding of the terms shifted through the course of the event, the majority felt they had. There is no one approach that is right for every scenario, and different projects require different processes. 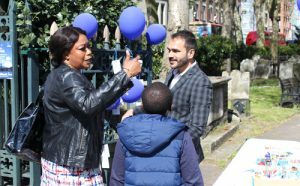 Everyone came together however in valuing the roles communities can play within the design of their spaces, and the potential these processes have to break down barriers. Beyond Buzzwords was the first in our WE design series of events. 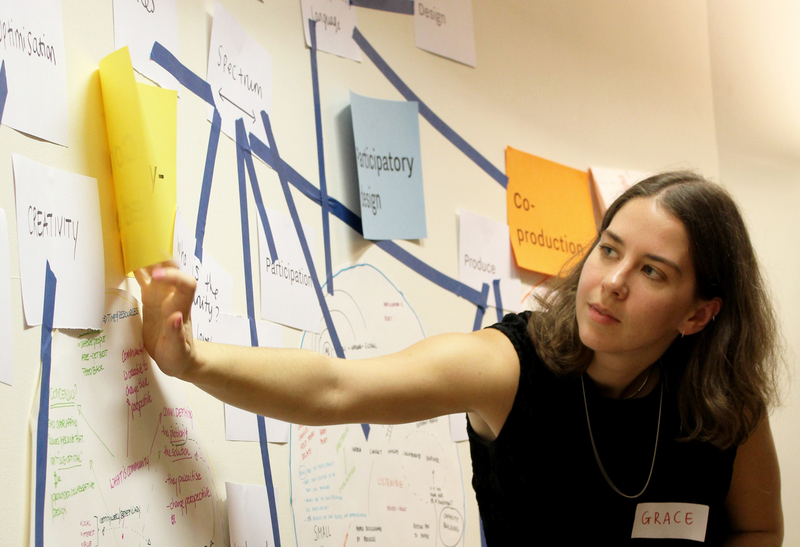 WE design events are active spaces, in which participants work together to develop ideas, proposals and prototypes which challenge their own and other people’s perceptions of design and placemaking. Our next event is 28th November in Sheffield, with upcoming dates in Edinburgh and London.